Product prices and availability are accurate as of 2019-04-25 04:55:04 UTC and are subject to change. Any price and availability information displayed on http://www.amazon.com/ at the time of purchase will apply to the purchase of this product. Many sunrise alarms use irritating bright white light to wake you in the early morning, HeimVision A80S alarm clock starts with a more soothing Red-tinted light that gradually grows into white light. This approach feels more natural and may be more effective at helping you feel less groggy when you wake up. HeimVision alarm clock with dual alarm can set four separate wake-up times, and wake you up at desired time with 8 types of alarm sounds. With a 5V/1A USB output interface, your smartphones can be charged smoothly while you are sleeping at night. It is not only an alarm clock but also a Bedside Lamp or Night Light. Use it as a bedside lamp, just press the ? button on the upper left to switch it on and press the "+" / "-" button to adjust the brightness. 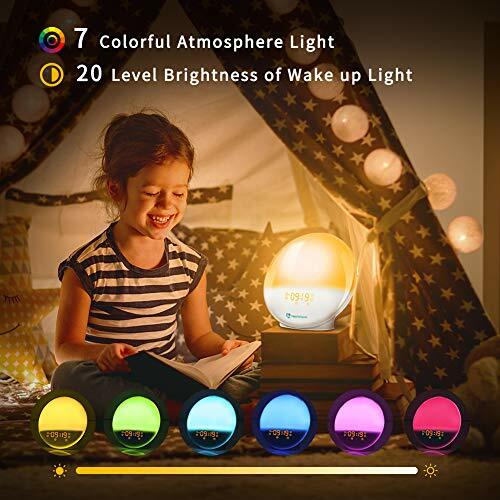 Use it as a Night Light when you need to get up at night to feed your baby or go to the toilet, just Tap the hidden button on the top of the clock to turn on / off the night light shortly. 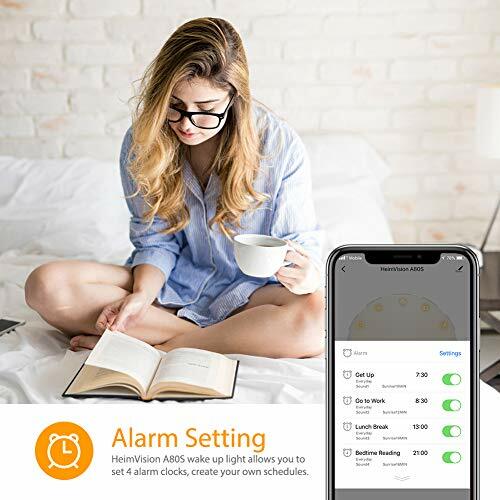 With large snooze button on top of bedroom clock, mornings just got easier.Enjoy a comfortable and prolonged wake-up with the 15 minutes snooze option, and experience zero stress when setting the time or alarm. With simple and modern design, this alarm clock is great size to sit on the corner of desk, shelf, kitchen and bedroom at home or office at work. DC power is required for ALL functions working, while built-in battery backup (Included) with memory function can only ensure to maintain the clock time, alarm settings during power outage. 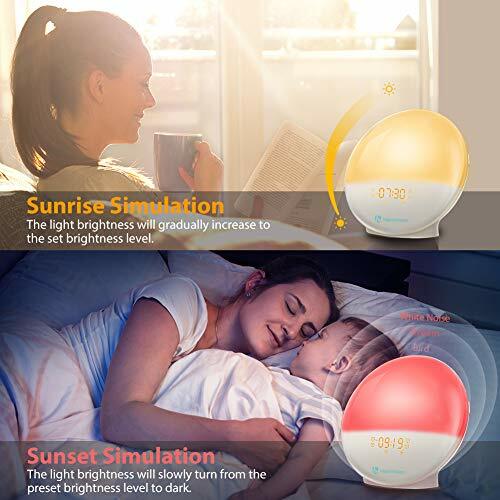 ?Sunrise & Sunset Simulation?HeimVision wake-up light is a good choice for you to program regular wake-up and bed times. Sunrise simulation----Light gradually increases before your preset wake up time until your room is filled with bright yellow light. The light will mimic the sunrise to help you wake up more naturally. Sunset simulation----Light and sound gradually decrease to your set duration to relax you into sleep. ?Compatible With Amazon Alexa Hands?The alarm clock can Works with Amazon Alexa Echo and Google Home Assistant. 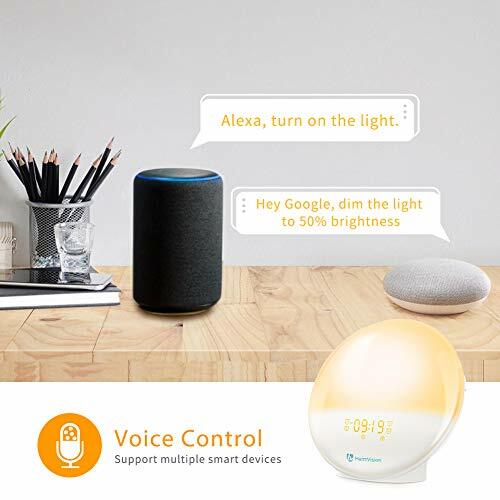 Try "Alexa, turn on the light" APP: Smart Life (supports IOS 8.0 above, Android 4.4 above). Only supports 2.4GHz Wi-Fi network. ?7 Natural Sounds and FM Radio?There are 7 kinds of unique alarm clock sounds to choose, Such as Birdsong, Hawaii Wave, Streams, Beep, Win dells, Chord, Ringtone and Piano, which can bring you fantastic nature sounds. As well as have a FM Radio function, easy to add the VOA as your new alarm sound you like. 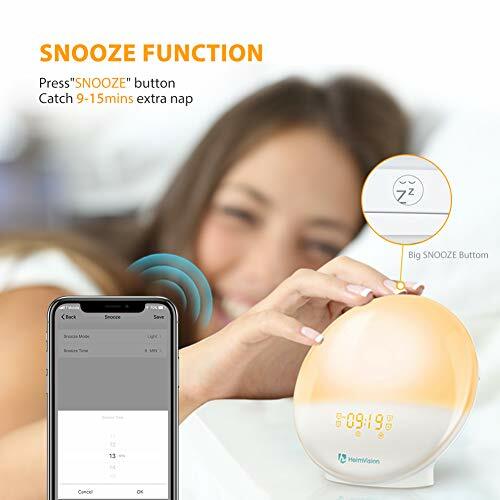 ?Considerate Snooze Function?The considerate snooze function was created for those who needs an extra 15 minutes to prepare yourself for the day ahead, just gently pressing user-friendly top big "Snooze" button to enjoy a comfortable and prolonged wake-up sweet sleeping. 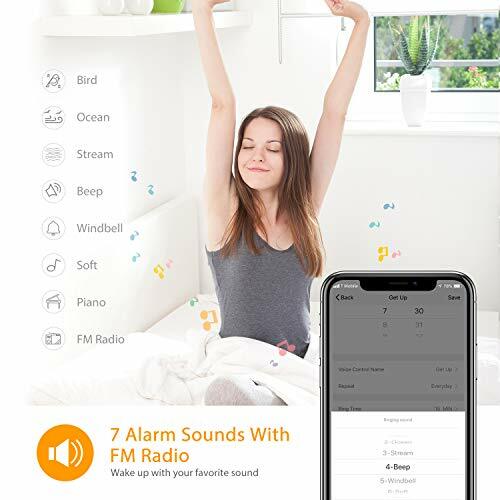 ?Ease into Your Dreamland?HeimVision alarm clock with built-in excellent speaker and volume range delivers 3 soothing natural sounds, which effectively mask disturbing noise at night and help you relax. Also producing white noise, birdsong and streams, which are most like what your baby hears in the womb and can work well to lull babies to sleep. With a more constant sound, make you and your baby sleep like a baby.